Successfully Added T8 GSM Watch Phone - Pedometer, Sleep Monitor, Sedentary Reminder, SIM Slot, 1.54 Inch Screen, Notifications, Call Answering to your Shopping Cart. Putting all the functions of a cell phone on your wrist and packed full of functions the T8 smart watch is a sleek health and fitness gadget combined with a phone. 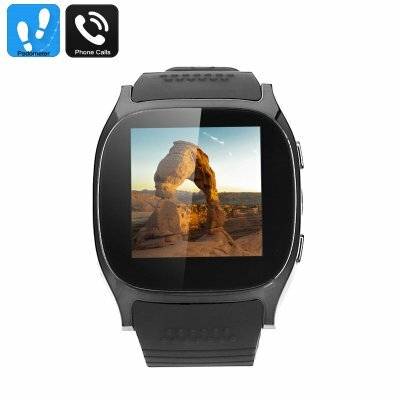 This cheap smart watch lets you make and receive calls directly from your wrist making it a must for those who want to travel light but don't want to be disconnected from family and friends. The GSM SIM card slot brings international support so you can travel light and leave the smartphone at home. When paired with an Android smartphone you can make use of the partner functions which will push messages and notifications direct to your wrist. With the watches anti lost function you'll never leave you smartphone behind again. T8 smart watch lends a helping hand for keeping your fitness on track and offers a pedometer step counter so you can see how active you've been. For those who get desk bound at work, a sedentary remind will keep you on your toes and fend off bad habits of sitting still for too long. You'll even be able to track your sleep patterns and ensure you're getting enough quality rest for a balanced and healthy life. All this is brought to you in a delightful package that features a 1.54-inch display allowing you to see all the information you'll need in great clarity at the touch of a button. The micro SD card slot will let you load up on music to keep you motivated at the gym and with its 380mAh built-in battery, you'll enjoy a day worth of usage from every charge. The T8 smart watch phone comes with a 12 months warranty, brought to you by the leader in electronic devices as well as wholesale smart watches and cool gadgets..